Empirical Labs EL9 Mike E Preamp Compressor Tape Saturator DAW Channel Strip. 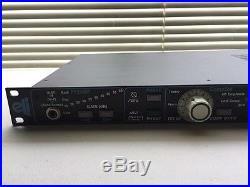 Up for sale here is an Empirical Labs EL9 Mike-E Preamp / Compressor Channel Strip in excellent condition! Comes complete with original box, manual, and power cord. You'll be hard-pressed to find a better deal on an awesome recording front end ;-0. When the engineering team at Empirical Labs sets out to build a microphone preamp, you can be sure itll deliver spectacular sound, be effortless to work, and will provide features unlike any other device in its class. To that end, we proudly present Mike-E, a high performance transformer-coupled mic preamp with a noise floor far below any microphones self noise, combined with a one-of-a-kind compressor/saturator circuit that delivers classic knee compression as well as versatile tonal coloring that can replicate many of the best characteristics of vintage analog recording equipment. In todays modern age of digital recorders, DAWs and software plug-ins, Mike-E is the ultimate solution for getting a clean and strong, yet warm and musical signal into the boxand it couldnt be easier to work its front panel layout is so straight ahead that even inexperienced engineers will have no problem moving around on it right away. This is a super low noise transformer input amplifier section with the gain under precise digital control. The signal to noise far exceeds any microphone in existence. Having used many mic preamps over the years, weve implemented a unique stepped gain control that should be impervious to the normal flakiness that age causes to pots and detented switches. LED indicates when the input signal is overloading the circuit. The CompSat's unique circuitry sets the Mike-E apart from all other mic preamps. SATURATOR - a multi stage soft-clipping circuit. At lower levels, a triode-type saturation affects the signal. As the level increases, a second unique clip circuit starts to more severely flatten out the peaks. COMPRESSOR - based on ELIs world famous Distressor, but with other characteristics (including a much longer attack time). Preset ratios include: 2:1, 4:1, 8:1and, of course, Nuke. EMPHASIS - a two-stage circuit that boosts and soft clips high frequencies before the CompSat circuit, and then cuts the frequencies after it. Emphasis has the added perk of improving signal to noise, and is the reason analog tape decks used emphasis to begin with. MIX - provides parallel compression technique achieved by mixing between the compressed and the dry (or uncompressed) signal. This can often help maintain transients and a sense of dynamic range while enhancing the low level nuances. Other features include a front panel instrument input that allows the unit to function as an ultra-clean Direct Box and stereo-linking capabilities. Mike-E can also be combined with an EQ (such as the ELI Lil FrEQ), transforming it into one of the most powerful, flexible and complete channel strips on the market. I cant think of any other preamp/compressor that has the same extraordinary level of flexibility, ease of operation and extreme tonal range. It does clean and bright, dark and fuzzy, and everything in between... And with only a couple of controls and switches, finding a sound is a very fast and intuitive process. Mic Preamplifier with super low noise and stepped gain switching. Built in Direct Box, called the Inst In, offers unparalleled. Distortion, noise, and frequency response when pre-amping. Colored 80Hz High pass filter emulates the warm low. Frequency cut of our favorite vintage equalizers. Phase Switch to invert the audio signal 180 degrees. CompSat offers both a musical Compressor/Limiter and a unique. Emphasis high-frequency emphasis system softens high. Frequency pile-ups and further the creamy color of the Mike-E. Mix Control allows the blending of the Compressed/Saturated. Signal with the clean unprocessed Dry signal. Response is 3 Hz to 200 kHz on (No CompSat). Optional Transformer output is 6Hz80kHz. 0006% and 15% depending on mode and settings. Transformer coupled Input, Active and Transformer Outputs available. High quality audio caps used internally. Input Impedance is above 600 Ohms at all frequencies, transformer coupled. Output impedance is less than 38 ohms. Instrument In Impedance is 332K Ohms. Power Consumption 15 Watts Max. Packing: Everything is packed to high standards with quality packing materials. Check my feedback to see other ebayers comments about my packing. All packages are always fully insured just in case. _gsrx_vers_625 GS 6.9.7 (625). The item "Empirical Labs EL9 Mike E Preamp Compressor Tape Saturator DAW Channel Strip" is in sale since Saturday, July 15, 2017. This item is in the category "Musical Instruments & Gear\Pro Audio Equipment\Preamps & Channel Strips". The seller is "mutinymusic" and is located in Los Angeles, California. This item can be shipped to United States.